← Have you loved a cat more than a person? Cat food Moroccan style. The photographer is Eugenia Burgo. Nice picture. Well done. This raw fish is food for a Moroccan cat. If this sweet looking white cat eats this raw fish all the time she’ll end up with brain damage and possibly some obscure disease. Raw fish should not be fed to cats. Raw fish contains an enzyme that destroys vitamin B1, which is thiamin. If a cat is deficient in thiamin she will eventually suffer brain damage¹. Also fish is deficient in vitamin E and carries diseases. This information is strange because people think cats can and should live off fish. Lots of feral cats at harbours around the world feed on raw fish. Perhaps they eat other foods to maintain a balanced diet. Cat Owner’s Home Veterinary Handbook page 512. Third Edition. 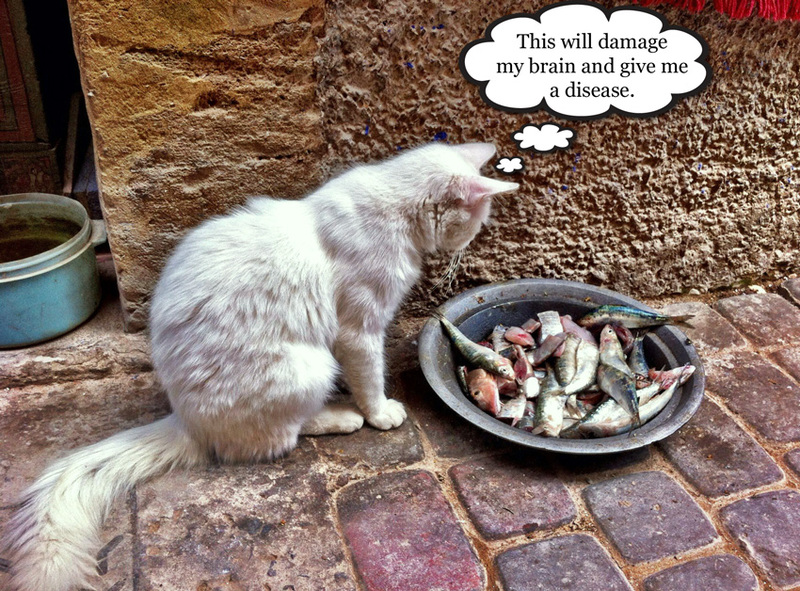 This entry was posted in Cat Food, Cat Health, Infection, mental health, Stray Cats and tagged cat food, cats fish, marrakesh, morocco, vitamin D by Michael Broad. Bookmark the permalink. Oh yes too much fish is actually bad for cats and they do need meat to stay healthy. Poor cat, that dish of fish looks really unappetising! It’s a fallacy that cats love fish, they are meat eaters in reality. There are a couple of wild cats: fishing cat and flat-headed cat that eat a lot of fish but they also hunt other animals. I agree that although cats, wild and domestic, do eat fish they primarily eat mammals. It is a balance. To eat fish exclusively is unhealthy for a cat. Good information to know. I think that cats that eat scraps probably scavenge other food on their own. Hopefully this would keep them from over doing it with the fish. Great pix. Thanks for the information Michael.I never feed my cats any raw food, its always cooked. I wonder whats the health and survival statistics of the stray cats of “Worli Fish market” near my house in Mumbai.These cats live entirely on raw waste discarded fish and meat products. I know of one of these cats thriving on that food, the freak cat named “Rajhe” on whom i wrote an article which was on “P.O.C”. This particular cat is the darling of the market and receives the best of raw food products.I wonder as to the average longevity of feral cats living on raw food products as in the case of the “Worli fish Market”.One thing i have observed, these cats are prolific breeders and kittens are always present along with the big cats, although very few of these kittens attain adulthood. Not that I feed Tootsie raw fish, but I didn’t know this. Thanks for the information. During my travels in Morocco I ended up taking a lot of pictures of cats, mostly in Marrakesh, but also in Essaouira. Latter is a seaport, so I’m sure the street cats eat plenty of raw fish. Sadly, the state of the cats is such that they are lucky to find a good meal. I want to thank Marc for showing me this picture. Nice picture and instructional, too, on a number of levels. I’ll ask her if she took any more pictures of cats. She said she saw alot of them out there.